North America, USA: United States, 48 US states only + Canada. Direct 2-way satellite speed internet service for home or office. The 5950 kg satellite was successfully launched 17th July 2004 by Ariane rocket from Kourou, French Guiana, South America and commercial service for the US and Canada started end June 2005. See Ka band satellite service news for latest information. In Canada, Telesat re-sell the satellite service with using several resellers: Xplornet, Infosat, NetKaster, NorthernTel and Telebec. Anikast may be Telesat's own name brand. In the US, you can buy the Ka band service from Wildblue and it is resold again via a large number of rural electricity cooperatives and other organisations. The overall network should provide for up to approx 750,000 customers, assuming each uses an average of 1.5 kbit/s upload and 3 kbit/s download capacity. I had some discussions with friends last week (12 Oct 05) and they agreed this assessment was about right. The 1.5 kbit/s for the upload may be slightly high. If anyone who knows better please tell me. The number of users possible is inverse to the average bit rates used by the customers. Bear in mind that the traffic flow will not be steady. Individual users will peak at 1 or 2 Mbit/s, while averaging only 3kbit/s. Assuming 50% fill the satellite will need say 4500 Mbit/s download and 2250 Mbit/s upload capability. The Outlink download bandwidth = 45 transponders of 54 MHz = 2430 MHz. so outlink capacity seems feasible if we get say 2 bit/Hz. Return link capacity is 6 transponders of 500 MHz = 3000 MHz. operating in FDMA, so return link capacity seems feasible also. The VSAT terminals transmit (65cm - 1.2m diameter and 1 to 4 watts, with 3 dB uplink power control range) at bit rates between 300 kbit/s and 2 Mbit/s in the 500 MHz wide frequency band 19.5 to 20 GHz. These signals go up into 45 small satellite receive spot beams, each with G/T=+14 dBK. The signals are frequency changed and downlinked via 6 hub spot beams aimed each of the 6 large hub dishes. Each hub downlink beam is 500 MHz wide and uses a 90 watt linearised TWTA. Note added 12 Jan 2006: In a conference yesterday, ViaSat CEO Mark Dankberg reiterated the capacity of WildBlue using the existing satellite as 300,000 subscribers" so maybe the average traffic per customer is more like 3kbit/s up and 6kbit/s down. There is also the consideration that in multi beam satellites that I have dealt with you tend to get one or two beams jam pack full, most partially used and a few with negligible traffic. My first estimate assumed even loading. If users exceed 30 day traffic thresholds of between 2.3 and 17 GB restrictions are applied. VSAT terminal: Using 65cm diameter, 1 watt, 29.75GHz, uplink G/T=+14, bandwidth=300kHz C/Nup=17.7 dB looks good Small spot beams are a good way to increase the uplink G/T. The uplink noise temperature is more or less fixed by the temperature of the earth and the LNA technology so reducing the spot size is a valuable way of improving the uplink link-budget. It also eases the transmit power requirements (and cost) at the VSATs. The cost of the VSATs adds up rather when you consider that there are going to be 750,000 of them, it is important to keep the costs of the VSAT down to minimize overall network costs. The picture on the right is of a Ka band terminal in Canada. Note the mount arrangement is which is adaptable to vertical walls, horizontal surfaces and sloping roofs - at any angle. The small lightweight design is a big step forward in ease of installation. The indoor unit is a low cost broadband satellite internet access modem called Surfbeam from ViaSat ( 133k pdf file). 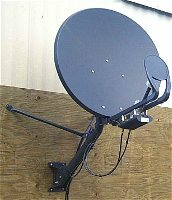 VSAT uplink: Using 65cm diameter, 1 watt, 29.75GHz, uplink G/T=+14, bandwidth=300kHz C/Nup=17.7 dB looks good Small spot beams are a good way to increase the uplink G/T. The uplink noise temperature is more or less fixed by the temperature of the earth and the LNA technology, so reducing the spot size is a valuable way of improving the uplink link-budget. It also eases the transmit power requirements (and cost) at the VSATs. The cost of the VSATs adds up rather when you consider that there are going to be 300,000 - 750,000 of them, it is important to keep the costs of the VSAT down to minimize overall network costs, which comprise both the total cost of all the customers equipment and the cost of the satellite plus hub operating costs. VSAT downlink: The Ka band spot beams each have an EIRP of 55 to 58 dBW. 17 spot beams pointed at areas with greater rain in the eastern half of the US have more power, a 90 watt TWTA for each beam. The remaining 28 beams operate in pairs, with each pair sharing one 90 watt TWTA amplifier, so the EIRP for those beams will be about 3.5 dB lower. An advantage of using TWTAs is that the collectors operate at very high temperatures which makes it easier to get rid of the heat. The 6 hub dishes each transmit 7 or 8 carriers, each 54 MHz wide, one to each of 7 or 8 spot beams. Each downlink beam to the VSATs has one 54 MHz carrier using 90 watts to give a downlink eirp=57 dBW, or 54 dBW in the case of two carriers per TWTA. The downlink symbol stream is in DVB-S format and contains a variety of symbols according to the weather in the target area. This means that the information bit rate varies with the weather, being higher in clear sky and lower in rain. If a fixed modulation method had been used a high rain fade margin would have been needed and the information rate would have been fixed at that achievable during moderate rain. Latency: The use of Ka band and spot beams makes no difference. Latency is due to the distance to and from the satellite plus processing delays in the network. The effect of latency is a problem for TCP/IP downloading and most satellite internet access systems use some form of acceleration. WildBlue uses the LinkStar SM-2000 Surfbeam modem which has embedded in its software the Mentat Sky-X client software. At the Wildblue hubs they have the Mentat SkyX hardware device that will do the processing simultaneously for many remote terminals. In some other satellite systems, such as Eutelsat SkyLogic, using Viasat LinkStar modems the end user customer can download the free Mentat SkyX client module to achieve acceleration. Please send me feedback on your experiences with the new Ka band service or your corrections and amendments to the above information which I am trying to keep up to date and correct.